"You should be careful not to throw stones when you live in glass towers," said Pincus, when asked about the ever-so-slightly-snarky open letter Zynga received from Tiny Tower developer, Nimblebit, last week. 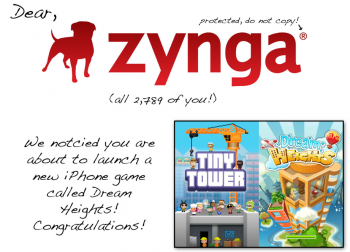 The letter quite politely pointed out that Zynga's upcoming Dream heights is essentially a marginally-less aesthetically-pleasing bootleg of Nimblebit's successful Tiny Tower. "When you pull the lens back, you saw that their tower game looked similar to five other tower games going all the way back to SimTower in the early 1990s," Pincus continued. Now, Tiny Tower does resemble OpenbooK's Sim Tower: The Vertical Empire at first-glance, but Nimblebit co-founder Ian Marsh is having none of it. "It was a smart idea for Mark Pincus and Zynga to try and lump all games with the name 'Tower' together as an actual genre whose games borrow from each other," he said in an interview with Touch Arcade. "Sharing a name or setting does not a genre make." To be fair, Pincus doesn't really try to deny Nimblebit's accusations, instead he seems to be arguing that raw innovation isn't all it's cracked up to be. "Google didn't create the first search engine. Apple didn't create the first mp3 player or tablet. And, Facebook didn't create the first social network," said one internal memo penned by Pincus. "But these companies have evolved products and categories in revolutionary ways. They are all internet treasures because they all have specific and broad missions to change the world." Of course, this design philosophy didn't stop the social-gaming giant from suing Brazilian developer Vostu over a series of blatant rip-offs based on Zynga games. "Good artists borrow, great artists steal," as the famous saying goes. Who wrote that? Oh wait, it was me.